Been there, done that. That’s what Larry Woodward and Bob Richardson of Heartland Productions can boast. “I don’t think there’s anything that can happen out trying to film wild animals that we haven’t faced yet,” said Woodward, co-host of "ScentBlocker's Most Wanted" and "Outdoors in the Heartland"with Richardson. Just last month while hunting in Alberta, Woodward hand-fed a bear and then charged and treed another (Click here for story). He’s had bears climb up the tree he was in and had an elk come in and touch him. Name it and they’ve probably done it. Woodward, who grew up in northeast Missouri guiding hunters and fishermen, holds passions from smallmouth fishing and hunting big game, and he and Richardson continue their commitment to show outdoorsman where and how to pursue North America’s fish and game. He said he’s excited about their upcoming shows, a wide array from elk hunting in New Mexico and Colorado, to dall sheep in Alaska to an elephant in Africa. 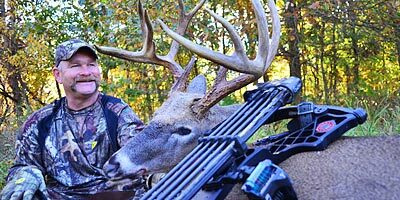 On “ScentBlocker’s Most Wanted,” there’s an CSI spin to hunts with avid outdoorsman Lauren Thomas introducing segments with fancy high-tech computer screens and info like they’re detectives on a case. Thomas and ScentBlocker president Scott Shultz also are featured on outings as well as guests. The approach is a sign of the times, and Woodward, who this spring completed his 35th consecutive turkey season in Missouri, said keeping up with the technology is critical in the industry. Woodward conducted seminars before imparting his knowledge on The Outdoor Guide radio show in the 1980s, which led to a TV gig in the mid-90s. At that time, large Beta cameras were used, and Woodward said battery life was a huge issue on hunts. They found a way around it, but it wasn’t easy on the crew. "Heartland Productions’ first Avid editing system cost $50,000, and now hopeful show producers with an inexpensive high-def camera can try to break into the business for a fraction of that, although Woodward sure wouldn’t want to be starting out today. Viewers can tell by the way Richardson and Woodward handle themselves in the woods and the hunting expertise they provide. It also helps to be entertaining, and Woodward has that down, like his recent bear exploits. While he always turns snakes loose, he can’t say the same about bears. He’s killed about two dozen and has had some odd exchanges along the way. Bears have climbed into the same tree he was set up in, and Woodward said he’s actually tapped them on the head with his arrow so they would back down. There have also been magical moments hunting elk, the species he’d pick if he was allowed to hunt only one. After getting the elk bug, Woodward has had interesting encounters, like the time a friend behind him called one to within mustache distance. He was decked out in ScentBlocker. The 5x5 wasn’t one he was not going to shoot, so he remained still as the bull smelled him and touched his shoulder with its nose before wheeling around. “I turned, laughed and said, ‘That was close,’” he said. That same year, they walked in five hours on the last day of elk season in New Mexico and called in 25 bulls. The Heartland Productions crew, though longer in the tooth and graying, keep on the move to make certain they don’t become obsolete. Shultz is headed to hunt in Africa while Woodward is making his annual trek to Ontario for walleye and smallmouth, the species of fish he’d target if he only got one. “Ontario is the best fishing in the world for smallmouth bass,” Woodward said. “There’s no better time than now, when they’re prespawn and spawning and shallow, they bite like crazy. With his enthusiasm, experience and aim to have fun on the shows, Woodward makes viewers feel like they’ve been there, done that.